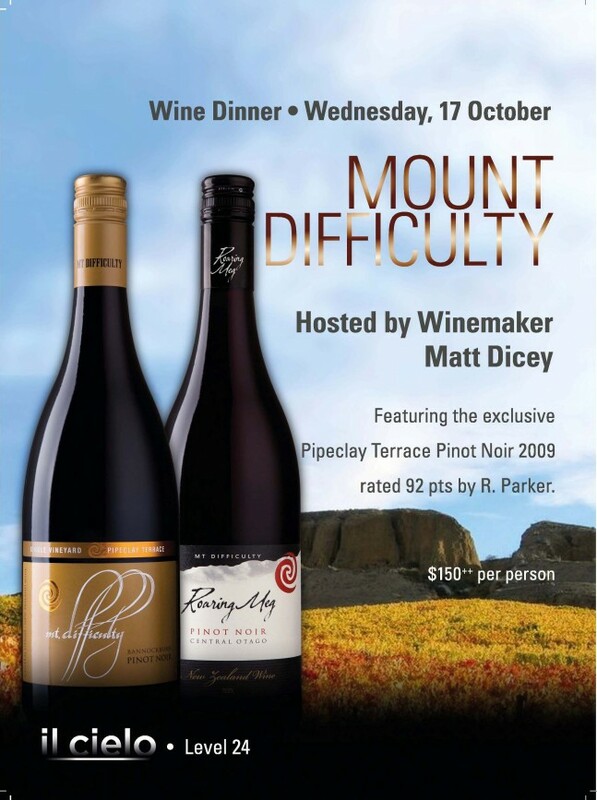 Consistently rated amongst New Zealand’s top 5 wineries, Mount Difficulty is one of the Wandering Palates favourite producers moreover, Matt Dicey one of the most talented winemakers on this planet. Dicey will host this one-night-only Wine Dinner on Wednesday 17 October with food and wine-pairings curated by the wonderful Stephanie Rigourd, Wandering Palate Sommelier of the Year along with the excellent cuisine of Il Cielo Chef Omar Bernardi. Il Cielo is one of Singapore’s best kept secrets, an intimate semi-alfresco restaurant poolside on the top floor of the Hilton Orchard Road, to which the Wandering Palate has enjoyed many excellent meals, but has told no one – otherwise it wouldn’t be a secret – would it! I can’t think of a better excuse to discover the place than being lubricated with luscious pinot noir from Central Otago in the company of the articulate and good-humoured Matt Dicey. This one is not be missed and places are limited.